Hammer Toes can affect anyone. Hammer toe results from shoes that don't fit properly or a muscle imbalance, usually in combination with one or more other factors. Muscles work in pairs to straighten and bend the toes. If the toe is bent and held in one position long enough, the muscles tighten and cannot stretch out. A hammer toe or contracted toe is a deformity of the proximal interphalangeal joint (PIPJ) of the second, third, or fourth toe causing it to be permanently bent, resembling a hammer. Mallet toe is a similar condition affecting the distal interphalangeal joint (DIPJ). Claw toe is another similar condition, with dorsiflexion of the proximal phalanx on the lesser metatarsophalangeal joint (MTPJ), combined with flexion of both the proximal and distal interphalangeal joints. 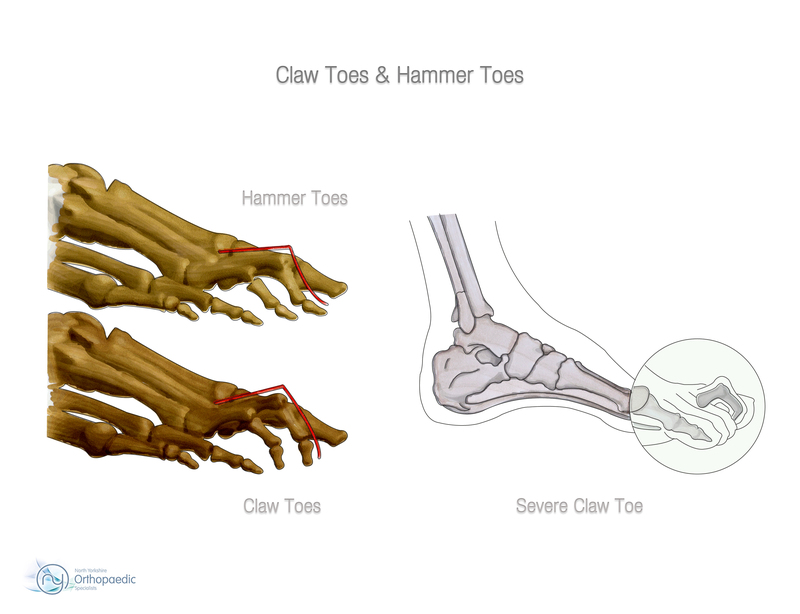 Claw toe can affect the second, third, fourth, or fifth toes. The condition is readily identifiable upon examination by your Consultant. An x-ray may be required to look at internal structures in the foot. Your Consultant may also prescribe some toe exercises that you can do at home to stretch and strengthen the muscles. For example, you can gently stretch the toes manually. You can use your toes to pick things up off the floor. While you watch television or read, you can put a towel flat under your feet and use your toes to crumple it. Having exhausted all non-surgical means, your Consultant may recommend surgery. Usually, surgery is done as a day case. A cut is made across the top of the hammer toe. If several toes are operated on at the same time, each toe has its own cut. The joint in the middle of the toe is opened and some bone removed to allow correction of the deformity. The joint at the base of the toe may also need to be freed up through a cut on top of the foot. Occasionally one of the tendons from the underside of the toe is re-routed to the top of the toe to help keep it corrected. You can go home soon after the operation. The anaesthetic will wear off after approximately 6 hours. Simple analgesia (pain killers) usually controls the pain and should be started before the anaesthetic has worn off. The dressing on your foot can be removed two or three days after surgery and replaced with a simple adhesive dressing to cover the wound. You will be seen again about 10-14 days after your hammer toe operation to check the wound and the toe. You can walk on the foot immediately after surgery. The ball of the foot may be rather sore after the toe is straightened so you may wish to put most of your weight on your heel for the first week or two. After your stitches are removed you can start taking increasing exercise. Start with walking or cycling, building up to more vigorous exercise as comfort and flexibility permit. Most people can get back to their previous level of activity within 6-8 weeks of surgery. If you have only your left foot operated on and have an automatic car you can drive within a few days of the operation, when your foot is comfortable enough. Most people prefer to wait till the stitches are removed and they can wear a shoe. If your foot is comfortable, and you can keep your foot up and work with your foot in a special shoe, you can go back to work within a few days of surgery. On the other hand, in a manual job with a lot of dirt or dust around, you may need to take anything up to one months off work. How long you are off will depend on where your job fits between these two extremes. Overall over 95% are happy with the result. However complications can occur. Reflex Sympathetic Dystrophy - RSD (<1% people suffer a reaction to surgery with painful stiff hands, which can occur with any hand surgery from a minor procedure to a complex reconstruction). The commonest problem is that the toe can curl up again, usually to a much less severe degree then before. This occurs in about 5% of people, but only a few of these will have to have further surgery. Most people’s toes will be fairly swollen after the operation and settles down over the next few months.